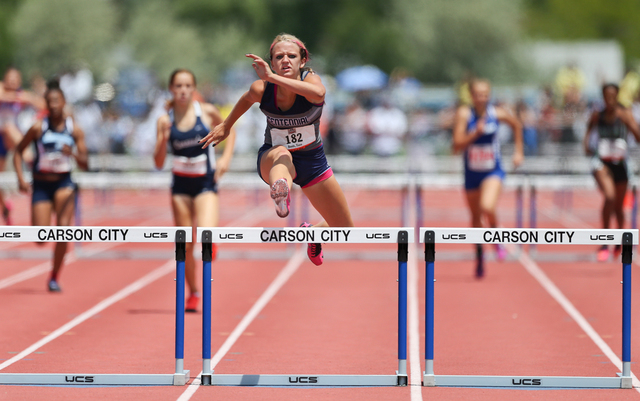 Centennial girls track and field standout Tiana Bonds has been named the Gatorade Nevada Girls Track & Field Athlete of the Year. Bonds, a senior, won two individual Division I state titles last month, setting state meet records of 13.5 seconds in the 100-meter hurdles and 41.47 in the 300 hurdles. Bonds was second in the long jump and ran the anchor leg on the winning 1,600 relay team. Bonds is the third Centennial athlete to be named state player of the year by Gatorade this spring. Softball player Heather Bowen and baseball player Cooper Powell also were honored.